A recent question in my Facebook Group about how to add nofollow links prompted the following WordPress SEO tutorial. First, let's start out by identifying what nofollow links are and why you may or may not want to use them. As of this post date, a "nofollow link" tells Google not to follow a specific link, thus Google does not give this link "juice" or any Page Rank benefits. 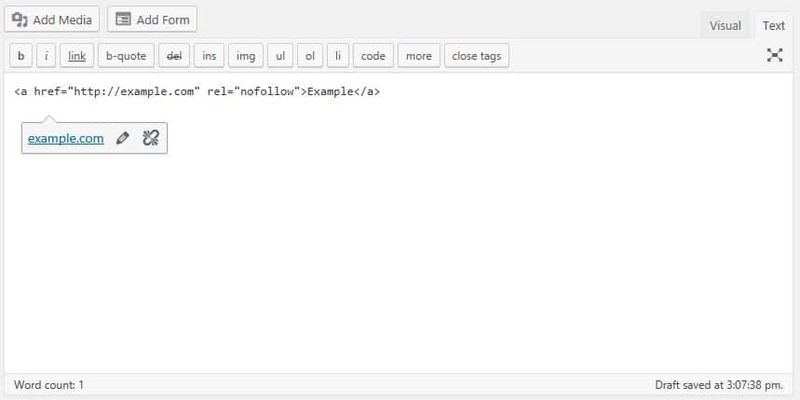 This post from Google explains how to use rel="nofollow" for specific links. "You used to be able to prevent losing link value to unimportant links by giving them a ‘no-follow’ tag. A ‘no-follow’ tag asks Google not to follow the link: so no link value is lost. Now you might think: “I’m going to ‘no-follow’ less important links to give the most important links more link value.” While this worked in the past, Google has become smarter. Now it seems that the link value for the whole page completely disappears when you add a ‘no-follow’ tag to a link on it. Therefore it makes more sense to have fewer links on a page instead of ‘no-following’ some of the links." 6 | Click on the PENCIL icon. 7 | Next click on the GEAR icon. 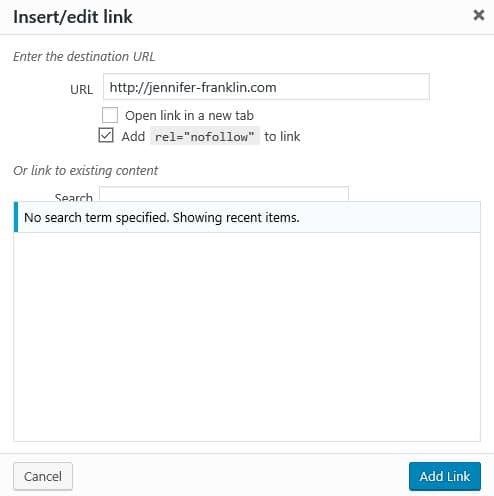 8 | In the Insert / Edit Link popup box check the "Add rel="nofollow" to link" box. 9 | That's it - you're done! 1 | Add a link to your WordPress page or post like you normally would with the Insert / Edit Link button from the Text Editor menu.